RNLI volunteers rescue porpoise stranded on beach. 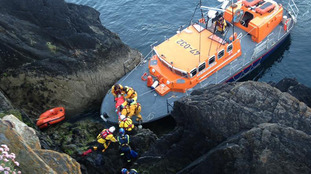 RNLI lifeboat crews from Douglas on the Isle of Man have rescued an unconscious man on a fishing boat. The 'Marine Engineer' was launched at 1pm to attend to a fishing boat moored at the Fort Anne Jetty. RNLI crews transferred the casualty to the lifeboat, before he was taken across the harbour to the Liner Berth where an ambulance was waiting. It is not known how the fisherman became unconscious. The Isle of Man Constabulary have praised those who helped locate a woman in the sea this morning. Three people have been rescued from a boat stranded off the coast of the Isle of Man. Peel RNLI’s lifeboat was launched by Belfast Coastguard on Sunday evening to help three people stranded on a broken-down boat four miles North West of Peel. The stranded cruiser had experienced total electrical failure. A towline was established between the stranded vessel and the lifeboat and was towed safely back to Peel Harbour and secured by 12.05am. Two people have been rescued after a yacht ran aground on the Isle of Man. Peel's RNLI volunteer crew were called out just before 1 am on Monday 18 June - following reports of a yacht that had run aground on a beach close to Jurby. They found a 10 metre yacht being bashed about by waves. Two people were on board. They used a tow rope to pull the yacht clear of the surf. Coastguard and RNLI crews from Douglas went to the aid of a 15-year-old boy who had fallen from a cliff on Saturday night. The Isle of Man Coastguard and RNLI were called out last night to rescue a missing person from a cliff edge. RNLI Douglas located the person at around 11:47pm on the foot of cliffs on the Marine Drive in Douglas. The lifeboat Sir William Hillary left Douglas Harbour around to the cliffs below the Toll Gate to primarily assist the Coastguard by using the lifeboat's search lights to illuminate the scene - a dingy was also used by RNLI volunteers. With the casualty safely back on the Marine Drive, the dinghy and its crew along with the Coastguard returned to the lifeboat, which then made its way back to Douglas. Volunteers from the Isle of Man's Douglas RNLI assisted in a multi-agency call to recover an unconscious male from a beach. Coastguards and paramedics had secured the casualty on a back board and stretcher on Port Skillion Beach just outside Douglas Harbour. Access to the beach is only via flights of steep steps at either end of the beach so the lifeboat was requested to evacuate the casualty from offshore. Deputy Second Coswain Tony Radcliffe took the all-weather lifeboat, Sir William Hillary, as close to the beach as the depth of water would allow then volunteer crew members Lavinia Washington and James Bettridge used the lifeboat’s daughter boat, an inflatable dinghy, to go ashore to recover the casualty to the lifeboat. With the casualty safely transferred to the lifeboat, the dinghy and its crew also recovered, the lifeboat returned to Douglas, to the Liner Berth where the Coastguard and paramedics were waiting to transfer the casualty to an ambulance to be taken to Nobles Hospital. The efficient way the crew handled themselves this morning is evidence of the regular training given by the RNLI, and in particular Lavinia who recently passed her Casulaty Care assessment and took a place in the dinghy. An Isle of Man lifeboat has had its last slipway launch this weekend after serving Douglas for 29 years. The RNLI's Sir William Hillary is leaving its usual berth at Douglas Lifeboat Station while a refurbishment of the building is carried out. For the next few months it will launch from Douglas Harbour. The final slipway launch from the lifeboat station was marked by a celebration with volunteers joined by boats from Ramsey, Peel, Port St Mary and Newhaven. A memorial service was also held afterwards for the boat's namesake, founder of the RNLI Sir William Hillary, who is buried in Douglas. A kayaker who attempted to cross from St Bees to the Isle of Man was rescued after five RNLI crew, a helicopter and Coastguard assisted.